Cleanup crews work to remove oil from the Kalamazoo River near Battle Creek in August of 2010. 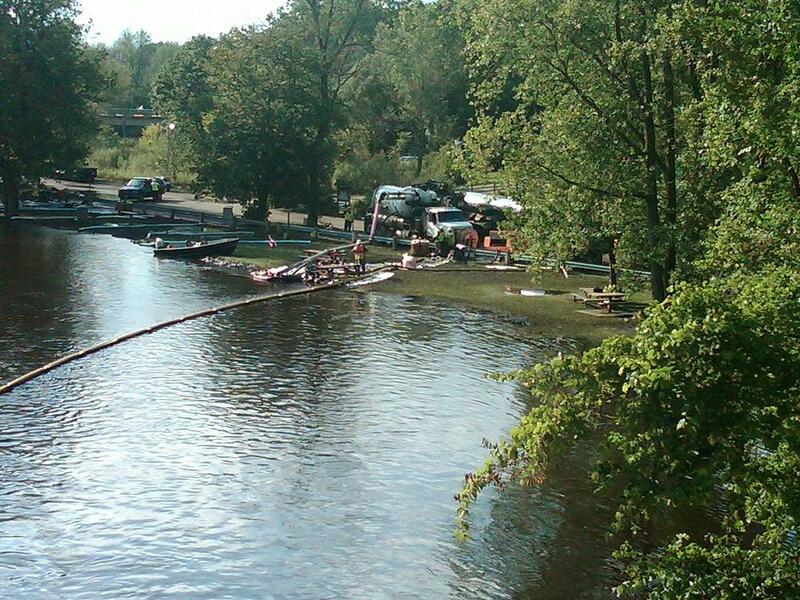 Nearly 15 months after an oil spill fouled miles of the Kalamazoo River, the pipeline’s owner is submitting an updated cleanup plan to the federal Environmental Protection Agency today. The July 2010 pipeline break spewed more than 840 thousand gallons of Canadian tar sands crude oil into the Kalamazoo River. Hundreds of workers have spent the past year removing contaminated soil, sucking up submerged oil and rehabbing endangered wildlife. But the work is far from over. A company spokesman says senior Enbridge officials spent Thursday reviewing and revising the new cleanup plan, that the EPA demanded after the company missed an August deadline. The new plan will detail how Enbridge plans to complete the removal of submerged oil in the Kalamazoo River, remove oil and contaminated soil beyond the river bank and how they’ll reassess their cleanup plans in 2012. Enbridge officials estimate the cleanup will eventually cost the pipeline company $700 million.